This Article is extracted from Mike Holt’s Illustrated Guide to Understanding NEC® Requirements for Solar Photovoltaic Systems. Click here to buy a copy or read more about it. *Please note in the follwing extraction that blue underlined text indicates a 2014 NEC change. 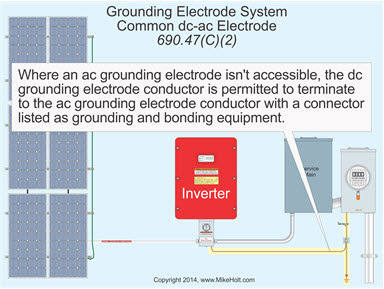 A common dc grounding-electrode conductor can service multiple inverters. 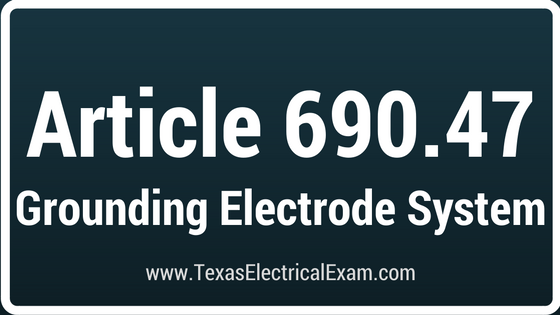 Section 250.166 is used to size the common grounding electrode and the tap conductors. The tap conductors must be connected to the common grounding-electrode conductor by exothermic welding or with connectors listed as grounding and bonding equipment. 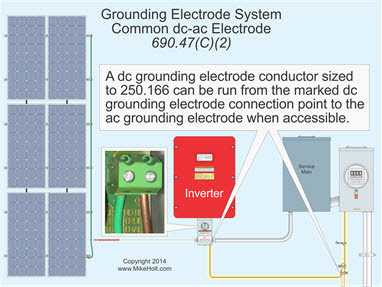 The ac grounding electrode system can be used for equipment grounding of inverters and for the ground-fault detection reference for un-grounded PV systems. The ac equipment grounding conductor is sized in accordance with 250.122 based on the rating of the ac circuit overcurrent protection device; the dc grounding electrode conductor is sized no smaller than 8 AWG and no smaller than the dc circuit conductors [250.166(B)]. Answer: Table 250.122 requires the ac EGC to be sized no smaller than 10 AWG, and 250.166(B) requires the dc grounding electrode conductor to be no smaller than the largest dc circuit conductors, but no smaller than 8 AWG. In this case, the combined EGC/GEC must be no smaller than 8 AWG. (D) Auxiliary Electrode for Array. 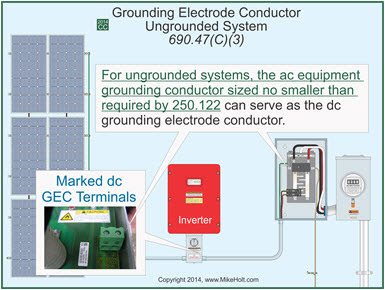 A dc grounding electrode conductor from the array structure sized in accordance with 250.166 must be connected to a grounding electrode that complies with 250.52 and 250.54. 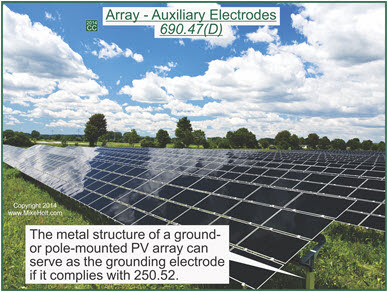 The metal structure of a ground- or pole-mounted PV array can serve as the grounding electrode if it complies with 250.52. Ex No. 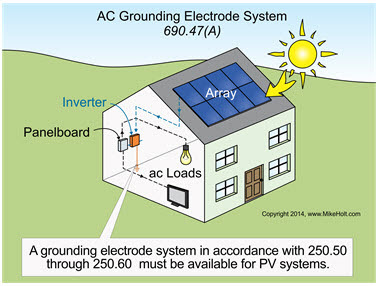 1: An array grounding electrode(s) isn’t required where the load served by the array is integral with the array. Ex No. 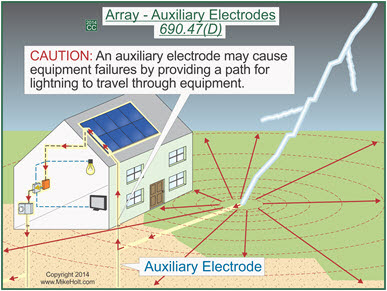 2: An additional array grounding electrode(s) isn’t required if located within 6 ft of the premises wiring electrode. Auxiliary electrodes have no NEC requirements since they serve no useful purpose relating to electrical safety, yet are permitted. If an auxiliary electrode is installed, it isn’t required to be bonded to the building grounding electrode system, required to have the grounding conductor sized to 250.66, or to comply with the 25-ohm requirement of 250.53(A)(2) Ex [250.54]. 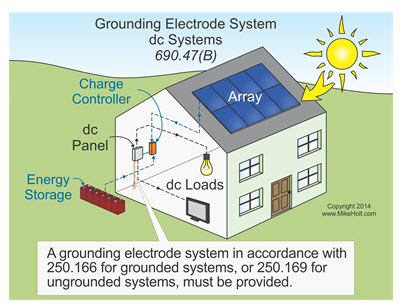 2014 Change Analysis: The requirements for grounding the PV array were included in the 2008 Code, but disappeared in the 2011 edition. Due to the fact that there was no technical substantiation in either the report on proposals or the report on comments to remove it from the 2011 edition, it was inserted back into the 2014 Code without substantiation. 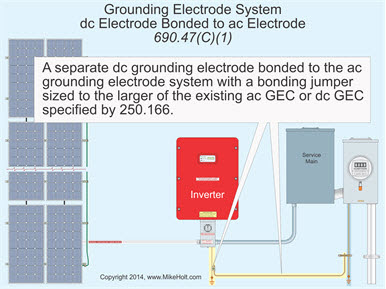 This Article is extracted from Mike Holt’s Illustrated Guide to Understanding NEC® Requirements for Solar Photovoltaic Systems based on the 2014 NEC®. 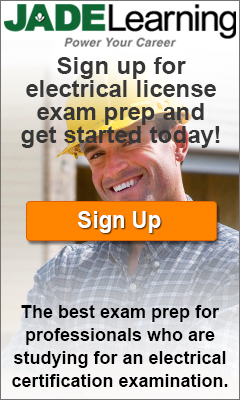 Posted in Resources and tagged 2011 nec test, 2014 nec, articles for the NEC, code book for electricians, electrician license, how to pass the exam, master exam test, photovoltaic.